People suffer from acne for a variety of reasons. In some cases, acne is a factor of the environment, in other cases, it’s caused by genetic factors. Acne can cause a significant amount of discomfort, both physical and emotional. To many patients, acne and acne scars can be quite debilitating. But our New York Acne scar laser treatment patients know that it doesn’t have to stay that way! Acne scars are left behind from even mild cases of acne. The deep inflammation and infection can leave behind deep pockets and uneven skin surface and tone. Boxcar Scars– oval or annular depressions that are wider than most scars, but do not penetrate deep into the skin, reaching the dermis. Hypertrophic or Keloid Scars– thick and raised scars that appear more commonly on the back or face. They spread beyond the original point of damage. Ice Pick Scars– deep and narrow scars that extend through both the epidermis (the upper layer of skin) and the dermis (the deeper layer of skin). Rolling Scars– appear as slopped scars that rise and fall from the skin’s natural surface. There are two main types of lasers used for acne scars: Fractional C02 lasers and fractional lasers. The difference between these lasers lies in the wavelength of light used and the amount of skin they target. Fractional C02 lasers treat microscopic areas of skin at a time. This fractional approach penetrates deep layers of the skin to stimulate the skin’s natural healing process by encouraging collagen production, which can ultimately allow for faster results. The wound-healing process begins with inflammation, moves to tissue formation, and ends with modifying specific factors in the anatomy such as collagen. Surgical scars occur when the wound-healing process is disrupted by biological factors such as too much collagen or depleted collagen. Keloid Scarring: Firm, raised, and reddish-purple scars that extend beyond the initial wound area and builds over time. Acne is one of the most common skin diseases in the United States. It is estimated that 60 million Americans suffer from acne and 20 million suffer from it badly enough to cause scarring. Acne scarring is the result of inflammation in the lower layer of the skin called the dermis which causes the collagen to become deformed or scarred resulting in depressions in the skin. Acne scars are typically classified into a boxcar, ice pick, and rolling scars. Lasers are a commonly used modality in the treatment of acne scars. Laser resurfacing has long been used in the treatment of acne scars. Traditional resurfacing lasers like CO2 or erbium can cause improvement in acne scars but require 1-2 weeks downtime. Non- ablative lasers such as SmoothBeam and CoolTouch, do not remove skin but at best are minimally effective in the treatment of acne scars. A new resurfacing procedure, named fractional resurfacing or Fraxel is currently the most effective laser in the treatment of acne scars. Dr. Rokhsar has been instrumental in the development of this laser having worked on a prototype device and has discovered its effectiveness for acne scars. Dr. Rokhsar has published the first study on treatment of acne scars with fractional resurfacing and has developed the parameters for use of this laser in the treatment of acne scars on the prototype device. This laser resurfaces the skin gradually, 20-30% at a time, which allows for rapid healing while eliminating the risk of rawness associated with traditional laser resurfacing procedures. The zones of thermal laser damage serve as a stimulus for collagen production filling in the pitted appearance of acne scars with your own collagen. In a study conducted by Dr. Rokhsar, the Fraxel laser can result in improvements of up to 50% in the appearance of acne and surgical scars. Dr. Rokhsar will tailor the procedure for to your skin depending on the type of acne scars which you may have. He may recommend subcision in addition for rolling scars as well as combining the Fraxel resurfacing procedure with punch excisions for ice pick scars. Treatments are typically done every 2 to 4 weeks Scars on any body surface area can be treated with the Fraxel laser, although scars on the face respond the best. Patients have to be aware that there is no cure for (acne) scars but that the Fraxel Laser in Dr. Rokhsar’s hands can result in significant improvement in the appearance of acne scars, far superior to any other procedures. Why choose Dr. Rokhsar for your acne scar treatment? Dr. Rokhsar is a recognized national and international authority on the use of lasers and in particular the Fraxel laser for the treatment of acne and other scars. When deciding on a treatment plan for your acne scars, the doctor will take into account the type and severity of your acne scars as well as any previous acne scar treatments you may have had. New York dermatologist Dr. Rokhsar treats acne scars in patients with a variety of skin types, including Asian, Indian and African-American skin. Because those with darker skin scar differently than those with lighter skin, it is important to find a dermatologist such as Dr. Rokhsar who has years of relevant experience. 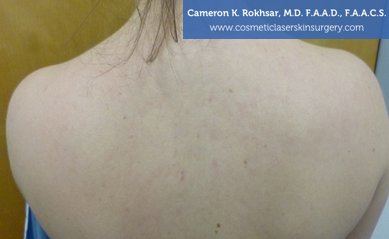 Dr. Cameron Rokhsar was closely involved in the development of most Fraxel lasers currently available. It is considered one of the most effective fractional lasers for treatment of acne scars. Individual results will depend on the patient and the severity and type of scarring. Dr. Rokhsar can help you decide if Fraxel Re:store, Dual, or Re:pair is the right laser for you. If you suffer from acne or acne scars, laser treatment may be a treatment option. 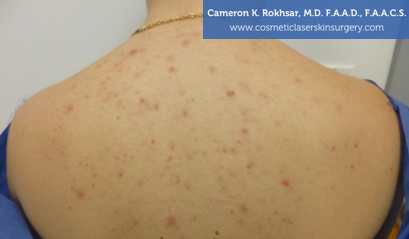 Many of Dr. Rokhsar’s patients who have undergone Fraxel laser acne scar treatment at his New York area office have reported significant improvement in the appearance of the skin. Although lasers can be effective on acne scars, the treatment may not be appropriate for everybody. If you would like to improve the texture of your skin, contact Dr. Cameron Rokhsar to schedule a confidential consultation and see what treatments can best help you improve the texture of your skin.